GM's combined U.S. sales of pickups, SUVs and vans rose 36 percent last month, offsetting weaker car volume. DETROIT -- Booming demand for General Motors' pickups and SUVs in February helped ease the sting of a 21 percent drop in car sales. Overall, GM sold 231,378 light vehicles last month, up 4.2 percent from a year earlier. Sales to individual buyers rose 1 percent while deliveries to fleet customers increased by 12 percent, GM said today. Combined sales of pickups, SUVs and vans rose 36 percent. 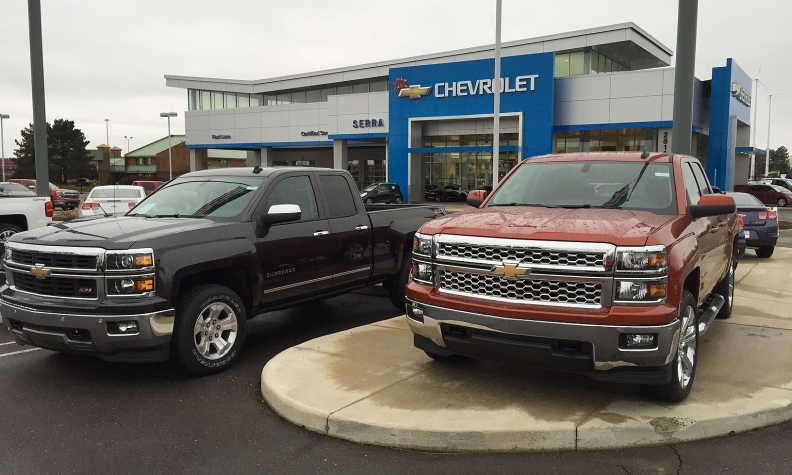 Sales of the Chevrolet Silverado and GMC Sierra full-size pickups totaled 60,552, up 19 percent and higher than that of Ford's F series (55,236). Sales of GM's large SUVs -- redesigned for the 2015 model year and launched about a year ago -- continue to surge as GM moves past quality and logistics hiccups at its Arlington, Texas, plant. Combined sales of the SUVs, which include the Chevy Suburban and Tahoe, GMC Yukon and Cadillac Escalade, rose 68 percent. Sales of 9,076 Chevy Colorado and GMC Canyon midsize pickups, which hit showrooms in the fall, aided GM's trucks total. That was higher than GM's January total of 8,147. The outsize truck sales drove GM's average transaction price to $34,700, up $2,700 from a year ago, but the lowest mark since October. “Our new SUVs and crossovers, combined with the three-pickup strategy we outlined more than a year ago, are dovetailing perfectly with the growing U.S. economy and a stronger job market,” Kurt McNeil, GM's U.S. vice president of sales operations, said in a statement. Sales of the Cadillac ATS compact, down 16 percent, were hurt by a stop-sale order that that took effect Feb. 12. GM's overall crossover sales rose 5 percent, led by the company's smallest entries: The Buick Encore, up 60 percent, to 4,921 sales; and the Chevy Trax, which debuted in December and sold 3,821 units in February. Truck brand GMC led the way with a 19 percent gain, to 42,433 vehicles, the brand's strongest February sales since 2002. Slumping car sales hurt GM's other three brands though. Chevy’s 3.8 percent gain sales masked sharp drops for its highest-volume cars -- Chevrolet Cruze down 16 percent, Malibu off 20 percent, Impala down 25 percent and Sonic down 62 percent. 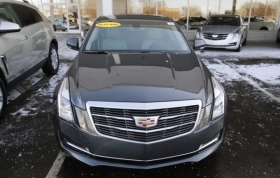 After snapping a seven-month skid of flat or lower sales in January, Cadillac reversed course last month with a 13 percent decline. The Escalade was the lone bright spot, outselling every car in Cadillac's lineup. Sales of the Cadillac ATS compact, down 16 percent, were hurt by a stop-sale order that that took effect Feb. 12 for an eventual recall to fix a problem with the sunroof. Buick sales fell 9.2 percent amid weak demand across its car lineup. For the first time since it was added to the lineup in early 2013, the Encore was Buick's highest-volume nameplate for the month. It was Buick's second straight monthly decline after the brand gained market share last year with an 11 percent sales increase.